Speak Agent provides critical realtime data for learning measurement, monitoring, and evidence—with zero data entry. The Speak Agent platform captures academic language learning progress, generates and stores digital portfolio items, and tracks assignment completion—all without you or your teachers having to lift a finger. There’s no quizzing or testing, so it doesn’t displace instruction time. All data capture is embedded in Speak Agent's online learning activities. Data are collected automatically as students enjoy learning through games, creative projects, and interactive practice. Measure targeted vocabulary growth in English, STEM, social studies, and other subjects throughout the year. Our built-in ALL Insights learning measurement tool captures thousands of data points for each student across each activity template and learning mode and uses these data to provide a composite picture of knowledge for each word/concept. The tool assesses multiple facets of academic concept knowledge so as to provide a confident picture of progress toward mastery: ALL Insights uses 10 different success measures for each word to support each student's unique learning pathway. Familiarize: Students develop familiarity with new words and concepts through repeated multimodal exposures. Comprehend: Students engage in integrated practice with dialogic reading, cloze activities, word and syntax games, and other types of independent, guided, and collaborative language practice to develop word comprehension in varied contexts. Apply: The progression culminates with multimodal composition involving writing, editing, speaking, and creative tasks that demonstrate usage in multiple contexts. This builds broader academic language comprehension, including syntax. Reports are available by student, class, and lesson. The word knowledge report displays a number 0 to 3 indicating the current stage for each word/concept (0 = insufficient data, 1 = obtained sufficient exposures for recognition, 2= able to comprehend meaning in multiple contexts, 3 = able to apply in multiple contexts). A red exclamation mark (!) is used to indicate trouble words, i.e., a student is stuck trying to understand or apply a particular word/concept. The report will note the stage and specific learning modes/activities where the student experienced repeated failed attempts. Whereas a student's proficiency level on WIDA ACCESS, CA ELD, TELPAS, or other summative assessments may not change every year, Speak Agent's ALL Insights gives you formative data that shows you learning in realtime. That can be particularly helpful in monitoring special populations where regular reporting is required. And it's stress-free and effortless for both students and teachers. A digital student portfolio is a collection of evidence, created by the student, that shows her or his work in descriptive context. This can serve as a qualitative indicator of student learning for teachers, i.e., it shows creativity and/or analysis of the words. It can also provide evidence that the teacher and school/district are making concrete efforts to aid special populations, as required by law. With Speak Agent, teachers don't need to scan writing samples, upload photos, enter data, or do anything other than focus on teaching. Speak Agent handles everything. Work samples and data are automatically captured in project-based activities. This even includes group activities. 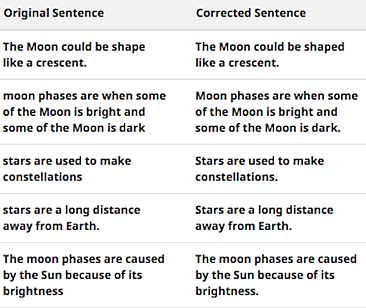 In the writing example shown at right, a student's original sentences are stored next to corrected sentences (after receiving peer feedback in reciprocal or team writing activities). The portfolio also collects multimedia compositions, including voice recordings, annotations to stories, and more!